Method to Improve Meditation – Belly Breathing | Learn Qigong Online @ Discover The Fire! The following is an article that was written by my friend, Dr. Kevin Chen. I highly recommend everyone subscribe to his free monthly E-magazine, Yang-Sheng as it features tons of great articles on a variety of relevant topics. Counting breath has long been a method used in meditation training. It appeared in Chinese literature as early as the Eastern Han Dynasty (25—220AD), when Buddhism was introduced to China. The famous Buddhist classic The Wisdom and Contemplation Sutra or An Ban Shou Yi Jing in Chinese , discussed prolonged and intense contemplation, which played an essential role in cultivating oneself in Buddhism. 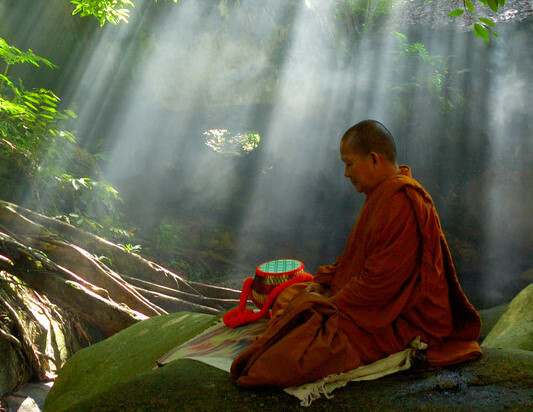 Under the guidance of Buddhist doctrine, the practitioner’s mind was to be fixed in contemplation or meditation. The phrase “Anban Shouyi” literally means entering the state of Dhyana (Sanskrit term for mental focus) and Samadhi (Sanskrit: mystical unity) by counting one’s breaths. Two techniques of Zen (“Chan” in Chinese) meditation are presented in this sutra. The first is generally called “counting one’s breath” and includes “the mind follows the breath, ceasing counting to reflect inwardly, and returning to purity …”, — all of these may be considered the foundation of Buddhist practices such as “Six Marvelous Methods” (Liu Miao Fa) and Breath-counting Contemplation (Shuxi Guan Pai). When I introduced qigong meditation to the patients of drug addiction, I heard many of them saying “meditation is not for me as I cannot sit still for one minute.” I realized that counting-breath method could be a very effective way to get them in a meditative mood, and boost their quality of awareness. Here I would like to share it with you, and to see if it may help your meditation as well. The human cardiovascular system is known to have resonance characteristics, with the first RF at ~0.1 Hz or about 6 cycles/minute. [2, 3] RF varies between 5 and 7 cycles per minute, probably depending on blood volume. [3, 4] RF breathing stimulates the cardiovascular system to oscillate at that frequency at a very high amplitude and greatly stimulates the baroreflect system. [5, 6] RF breathing is known to affect depression and stress symptoms as well as various somatic disease states. [7, 8]. I believe that including near RF breathing at the beginning of meditation training will make meditation easier and more feasible, and produce immediate physical and mental benefits for practitioners since clinical studies reveal that breathing at RF has therapeutic effects on asthma, hypertension, panic attacks, fibromyalgia, and major depression. [5,8] Therefore, the first thing I do with my addiction patients is teach them to practice belly breathing, after showing them how beneficial it is to breathe slowly and deeply. Study participants either get a MP4 player from me that includes a breathing instruction program (breathing at 6 times per minutes, or 10 seconds per nhale/exhale cycle) or download the EZ-Air program from www.bfe.org, set to 6 bpm. They use these materials to practice belly breathing everyday. In addition, I instruct them to make slow belly breathing a habit, to do it whenever possible, and to track how long they can practice each time without interruption. Here is a sample video to breath at near resonance frequency for you to start. Counting breath is a very easy and effective way to start meditation training, as one can do it anytime and anywhere. Your attention span will lengthen and you will gradually become more focused. First, find a clock with a second hand, and practice counting the seconds. This will teach you the speed and rhythm for counting your breaths. At the beginning, most people can usually count to 3, 4 or 5 breathing cycles before their mind wanders away. That is quite normal since mind tends to think all the time, and it is difficult not to think (Learning to quiet the mind is how meditation help us to relax and stay focused). Then, they are instructed to attempt counting to 3 or 5 (the usual number of breathing mind starts wandering away) plus 1 for the next two days until they feel comfortable and easy to reach the next level (4 to 6). The next day, their goal would be to count to 6 (5+1) breaths for every session. And then count to 7, 8,… up to 12 in the period of 2 to 3 weeks. 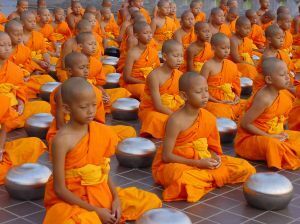 If they can count up to 10 to 12 without being interrupted by random thoughts (that is about 2 minutes), they should have no problem starting meditation. 1) When you wake up in the morning, before getting out of bed, bring your attention to your breathing. Observe six slow belly breaths (or count as far as you can). 2) Use any sound as your cue to starting a slow belly breathing (phone ringing, bird singing, train passing, a car, laughter). Really listen and integrate the sound into your slow breathing pattern. 3) Throughout the day take a moment to bring your attention to your breathing. Observe 5-6 belly breaths. 4) Notice your steps when you take a walk. Try to slow your breath to the rhythm of walking — 4-6 steps inhale, and 6-8 steps exhale – it may become automatic after some practice. 5) While waiting in line or waiting for your turn, use this time to count your breathing, Turn all your waiting time into rest time, recharging time, or slow breathing time. Try to do slow belly breathing and direct your attention to either your abdomen or the bottom of your feet. 6) Be aware of any points of tightness in your body throughout the day. See if you can apply relaxation by breathing into them – As you inhale, notice the tightness of the body, and as you exhale, let go of the excess tension – repeat it 3 to 5 times or until you feel relaxed. 7) Before you go to sleep at night, take a minute to bring your attention to your breathing. Observe six slow belly breaths (or count as far as you can reach). 8.) If you have difficulty falling asleep, take out the MP4 player, and start the breathing or meditation instruction. Even if it does not put you to sleep quickly, a high-quality breath counting or meditation will let your body and mind rest similar to when you are asleep. These guidelines worked well for most of my study participants. It not only helped them cope with stress, anxiety, and craving when it was most needed, but also trained their attention to the mind-body connection. This got them mentally ready for next step of meditation training, Eighty percent of participants in my study were able to move from counting breath to meditation in 2 weeks, and continued meditating 5 days or more a week (15 to 25 minutes each day). In addition, counting breath is an effective way to deal with random thoughts during meditation, and to bring attention back to lower Dantian or to a state of rest. The other methods to deal with random thoughts that may occur during meditation include: listening to the breath, observing the thoughts as a bystander (don’t judge them or get upset about them, just relax and observe as if you are watching a “movie”), and noticing the content of thought with the intent of using that as a cue to return to the meditative state.. If you have had difficulty starting your meditation, or getting into the deep meditation state, you may try these methods in your daily practice. You could soon become a master meditator before you notice it. 2. DeBoer, R.W., Karemaker, J.M., & Strackee, J. (1987). Hemodynamic fluctuations and baroreflex sensitivity in humans: a beat to beat model. American Heart Journal of Physiology, 253, (Heart and Circulatory Physiology, 22) H680-H689. 3. Vaschillo, E., Lehrer, P., Rishe, N., Konstantinov, M. (2002). Heart rate variability biofeedback as a method for assessing baroreflex function: a preliminary study of resonance in the cardiovascular system. Applied Psychophysiology and Biofeedback 27, 1-27. 4. Vaschillo, E. G., Vaschillo, B., & Lehrer, P. M. (2006). Characteristics of resonance in heart rate variability stimulated by biofeedback. Applied Psychophysiology and Biofeedback, 31(2), 129-142. 5. Lehrer PM, (2007). Biofeedback training to increase heart rate variability. Pp. 227-248 in PM Lehrer and RL Woolfolk (eds.) Principals and Practice of Stress Management, (Third Edition). New York: Guilford Publications. 7. Lehrer, P.M., Smetankin, A. & Potapova, T. (2000). Respiratory sinus arrhythmia biofeedback therapy for asthma: a report of 20 unmedicated pediatric cases using the smetankin method. Applied Psychophyisology and Biofeedback, 25, 193-200. 8. Schein MH, Gavish B, Herz M, Rosner-Kahana D, Naveh P, Knishkowy B, Zlotnikov, E., & Melmed, R.N. (2001). Treating hypertension with a device that slows and regularizes breathing: a randomised, double blind controlled study. Journal of human hypertension. 15(4), 271-8.